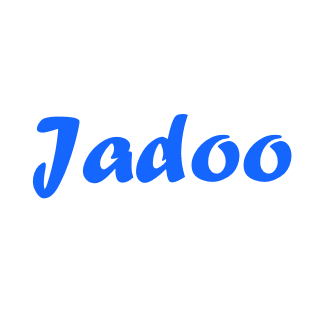 Jadoo-RB is the remind chat bot. 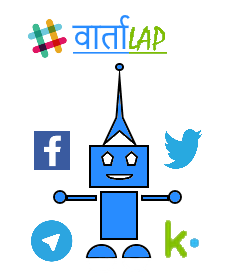 This chat bot is the first bot of Jadoo series. The Jadoo-RB is developed for Indians. This bot will help anyone to remind them about the task they ask to set reminder for. The bot presently work only for Asia/Kolkata timezone and hence can be used only by Indians (since people around the global will not get reminder on time due to different time zones). The Jadoo-RB is developed just for test purpose and for the very next bot in this series. It is developed using nodejs, j2ee, mysql and presently deployed on facebook page . The bot uses natural language processing to understand what user want to get reminded about and at at what time. If, any of the entity is missing then the bot ask the user for the missing entity. Go to the facebook page of Jadoo-RB from here (facebook page) or here (direct messenger link). Click on send message and hit get started button. Follow the instruction given by the Jadoo-RB. Remind me to develop chat bots after 5 seconds. Remind me to buy ice-cream after 7 hours. Remind me to get books from library on monday at 10 am. Return gta-5 to abhijith in the evening. Hey bot, remind me to forget everything on 13 Sept 2018. The privacy of all the user's are maintained and once the reminder alert is sent to user, the reminder are deleted within 60 seconds. If you face any problem while using the Jadoo-RB, try messaging it Help or Reset. 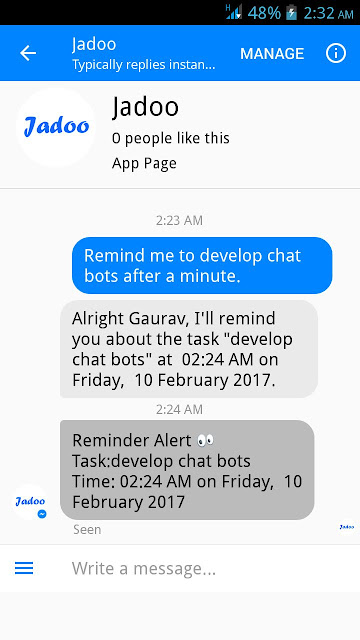 Want to learn how to develop chat bots? VARTALAP(connecting users across SNS) is a chat bot made for social networking platforms like Telegram, Twitter, Slack, KiK and Facebook. Wondering what this bot can do, well presently, it support the functionality of connecting the users across the above 5 social networking platforms. The users from one social networking platform can chat with another user from same or another social networking platform based on the gender they prefer to chat with. The bot will find a random partner for you based on the gender you prefer to chat with and once a partner is found you can chat with them. E.g. : Suppose you are a Facebook user and you want to chat with some random user from any of above 5 social networking platform. So below are the steps to achieve this task. Steps to chat from Facebook. Visit VARTALAP FB page here. The bot will reply you. (Note: since the fb app is under review process, so the bot wont reply until it gets reviewed successfully and is available for public). Follow the bot instructions to get registered. Steps to chat from Telegram. In telegram search for VartalapBot. Once found, send message to bot and follow the steps instructed by the bot. Steps to chat from Twitter. Search for vartalapbynp on twitter, follow the account. Send message to it and the bot will reply, follow the steps instructed by the bot. Steps to chat from KiK. Search for vartalap on kik. Once found, send message to it, the bot will reply you, follow the steps instructed by the bot. Steps to chat from Slack. Search for nerdprogrammer on slack. Once found, send message and follow the steps instructed by the bot. NOTE: The VARTALAP bot is still in beta stage. Continuous development being being done. If you find something weird or some bug, you are requested to report it us at VARTALAPBYNP. 1. Does the bot stores my personal information or the text that i send to any random user? a: The bot does store the personal information(only name, your social networking platform and gender) and also your chat in encrypted format for max upto 5 days. 2. How can I report a user? a: As mentioned above, the bot is at its initial stage of development, so very less features are available. So wait until the bot gets an awesome update. Till that time, you can exit the conversation by sending exit_chat to the bot and report the user to us over by sending mail here. 3. Can i send message to target user or group? a: Presently, the bot supports only finding random users for chat around the globe, but sending message to target users is not presently supported by bot. We are currently working on this feature. 4. The bot is not replying on Facebook? a: It's because making the Facebook app available to public, some special permissions are required, to get access to those permissions, the app needs to be reviewed and presently the VARTALAP is under the process of being reviewed, soon it will be available on Facebook ,til that time you can try it on other platforms.